Details of where Alexander Bowie was born, his parentage and exactly when he came to reside in the Burgh of Stirling have been extremely difficult to ascertain despite considerable research. In the initial research twelve years ago in Stirling we assumed that he was a 'son of the rock' as the name Bowie has been associated with the Burgh of Stirling for over 300 years. One attempt to identify where Bowie came from found us researching an entry in Colvin's "Dictionary of British Architects" where it is stated that Alexander Bowie, in 1810, was responsible for the repairs to the church at Dunning, a village in Perthshire. Research of the sasines or land registers of that village failed to yield information that might have lead to details of his ancestry. Later, however, in the same search another clue came to light suggesting that an Alexander Bowie had feud a house in another, nearby, Perthshire village called Muthill. Following further research both leads lead nowhere and there the matter lay for many years. Recently the situation changed and further clues to Bowie�s ancestry came to notice when the 'Annals of the Philps' became available. This document was researched and written in 1916 in Australia by James A. Philp the grandson of Alexander Bowie. This main body of this document consists of two parts. The first, a long list of all the Scottish Philps, gleaned from the Exchequer Rolls without any idea of genealogical links, while interesting, is useless for the serious genealogist. The second part on the other hand is the very opposite consisting of a dozen or so pages that have James� hand-written family history notes scribbled on them. Re Alexander Bowie my maternal Grandfather. 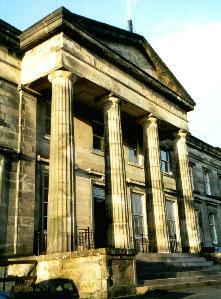 He was a native of Perthshire but settled in Stirling in the early 19th century and practised as an Architect. He married a Miss Hill, sister of Mrs Captain Forrester. he built a good part of the new town of Stirling Two of his sons William and Mathew were Physicians but died young. Margin note. My mother had the medical certificates of these uncles. also a case of surgical instruments. My sister Nellie may have these now. Alex died young. his daughters were Christina who married Mr Charles Young a Glasgow Ironmaster who died without issue. Helen my mother, and Margaret who died unmarried. My mother pronounced her name Boo-ee not Bow-ee or Bo-ie. I have a letter in my grandfather's handwriting and also one from my Uncle William. the latter mentioned a journey to England in that (then) new contrivance a steam boat?
" My Mother's father Alex Bowie feud a house at Muthill about 1790. House was standing in 1918. Bowie moved to Stirling in 1810 where my mother was born in 1823. There were no Bowies in Muthill in 1918. Note from Callum McKinlay of Crieff". Present day research has shown that many of James� beliefs, based on oral family tradition, were inaccurate. Once again, however, it firmly puts the Bowie pedigree in the village of Muthill and, as a result, a further search of the Old Parish Registers and the International Genealogical Index was undertaken. This showed that the only Alexander Bowie born in Muthill around that period was in 1766. Without definitive evidence the question still remained, Was it him? Because of a considerable lack of accurate records in the Parish of Muthill it was concluded, at that point, that ultimately it may be impossible to find any definite proof that Alexander Bowie the Stirling builder was born there. Once again the matter rested. Support for this point of view came from the following extract, for the Parish of Muthill, taken from the Statistical Account of Scotland 1791--1799 Vol. X11 North and West Perthshire.
" The exact number of baptisms cannot be so easily be ascertained. This is chiefly owing to the negligence of those who are not of our communion, or are connected with a chapel of ease in a distant part, and who seldom think of sending their children's names to be put on the Parish Register. There are however from 80 to 90 baptisms recorded annually. No register of burials having been kept, it is difficult to say, in what proportion births and burials stand to each other." Some months later, while writing a paper on the traditional naming of children in Scotland, new information was brought to notice. Information that again linked Bowie to Muthill and may well answers all our questions about this matter. The only recorded Alexander Bowie birth around the time in Muthill is 1766 and not 1779. From the traditional way that children were called for their Grandparents it was deduced that, with Bowie's eldest son called William, and if Alexander was an elder or eldest son, his father would also have been called William. With the second daughter, that is Helen, called after the paternal grandmother, Alexander Bowie's mother could have been called Helen. This hypothesis, about Bowie's origin, was formulated and written some three months before receipt of a photocopy, from Toronto of an archived family letter dated 28th July 1811. More than likely this letter refers to the situation that led, in 1812, to 'Alexander Bowie, mason in Stirling' being recorded in the Sasines, or land register, as having 'seised an acre of land and a house' at Muthill, near Crieff. We can assume that the family dispute was resolved in Bowie's favour. This reference to cousin also means that, probably in Muthill, a member of the Bowie family must have married someone from the Finlayson family. With this new information a further check of the information from the Old Parish Registers for Muthill showed that the the parents of the Alexander Bowie mentioned above as being born there in 1766 were William Bowie and Helen Finlayson. The odds of the names William, Helen and Finlayson exactly fitting the above hypotheses would seem to be too great to be coincidental and the hypothesis would seem to be vindicated. It is 100% accurate that Muthill was indeed the Stirling builder's birthplace. James Bowie the Texan pioneer and inventor of the Bowie knife who was killed at the Battle of the Alamo was a near relation of my Grandfather and hailed from the same village in Perthshire the name of which I forget but which I think was Muthill. Determined to set this matter to rest contact was made with the Daughters of the Republic of Texas Library in San Antonio, Texas who document every little detail of the Battle of the Alamo. They, surprisingly, confirm with full family tree, that Jim Bowie's grandfather John Bowie came from Stirlingshire, Scotland to Prince George County, Maryland about 1705. They also scotch the rumour that Jim was the inventor of the Bowie knife. That honour goes to his brother Resin. A search of the Old Parochial Registers for Stirlingshire and Muthill show that there were over a dozen John Bowies, born about the end of the 18th century, who could be the one who emigrated to Maryland and who could also have been kin of Alexander Bowie. While the story, at this stage, cannot be fully verified it can be supported as being entirely plausible.